The price of oil remained soft this week. Data from the EIA released Wednesday showed American crude inventories unexpectedly increasing to a one-year high. The market had actually expected a decline in inventories. Wednesday's data marks the 10th consecutive weekly increase in U.S. oil stocks and frightened off investors, pushing prices down to just $50 per barrel yesterday. Of course, OPEC was there to try to prop up prices. Reuters reported yesterday that Russia is now considering a cut to its oil supply and is in talks with Saudi Arabia over how much to cut and when. This is something we were expecting. The Reuters report is a good example of this. In fact, I'm beginning to wonder if Reuters and OPEC are somehow in cahoots. Anytime Russia and Saudi Arabia are reported to meet, Reuters always conveniently seems to be there to report on it. Either way, the news of the potential cut to Russian oil supply didn't help to boost prices this time. But I'm sure we can expect OPEC to continue talking about supply cuts over the next few weeks. It's difficult to say if any of that will actually have an immediate affect on oil prices. But I think we can be certain that OPEC and other oil producers are going to do everything they can to get oil prices higher than $50 per barrel. You''ll also get our free report, Two Stocks to Play The Coming U.S. Oil Export Surge by our resident expert Keith Kohl. Right now, oil is cheap. On Monday, I even mentioned that gas prices are so low as a result that people are getting surprised at the pump. And even though it may remain cheap for the next few weeks or so, it won't stay that way for long. I'm not ready to say oil has hit a bottom just yet. But it's getting close. Investors would do well to use this time to purchase high-quality oil stocks for long-term holding. I think it's very important to always keep in mind that oil is, in fact, a finite resource. And even though the demand for crude oil will lessen in the future, that's still a long way off. The demand for oil has skyrocketed over the past several decades. But it isn't expected to peak for another 20 years or so. Wood Mackenzie, a major energy industry consultant, doesn't see oil demand peaking until 2036. And that's a conservative estimate. Many major energy companies see oil demand continuing to rise through 2050. Point is, the demand for oil will continue to increase for now. And it's a resource the world will ultimately run out of. With oil prices at $50 per barrel, there looks to be much more upside than downside. I think it's a great time to start looking into high-quality oil production stocks for long-term holding. 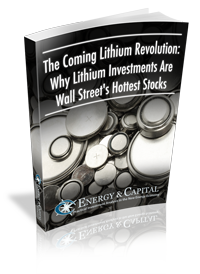 As an editor at Energy and Capital, Luke’s analysis and market research reach hundreds of thousands of investors every day. Luke is also a contributing editor of Angel Publishing’s Bubble and Bust Report newsletter. There, he helps investors in leveraging the future supply-demand imbalance that he believes could be key to a cyclical upswing in the hard asset markets. For more on Luke, go to his editor’s page. There’s one luxury the world’s billionaire’s can’t afford... yet. But that won’t stop the billionaires from trying to get this. In fact, this new tech is so revolutionary that Mark Zuckerberg has already pledged $3 billion to its research in the next decade. Oracle cofounder Larry Ellison has pledged $430 million. Google cofounder Larry Page: $750 million. By 2025, this industry is estimated to be valued at over a trillion dollars. That’s five times larger than the entire cancer research industry. Now that the adult use of cannabis is legal in Canada, soon to be legal in Mexico, and now legal in 10 states in the U.S., sometimes it can be easy to forget that cannabis is medicine. But that’s exactly what it is. And as investors, we have to remember that there’s a lot of money to be made in medicine. Capitalism, not the government, will solve the opioid epidemic. Jeff Siegel looks at the latest government attempt to find a scapegoat and the companies that will really be pivotal in ending this epidemic... and making you money in the process.